Salamis, Ambelakia bay. 3D representation of locating a target buried under the bay’s seabed. Photo. : P. Karantzas, composition: N. Georgiou. The military port of the ancient city of Salamis, where the Greek navy gathered to face the Persians in the Naval Battle of 480 BC, was located in the Bay of Ambelakia. The first systematic underwater research by Greek operators, begun in the region in 2016 and continuing in the summer of this year, came up with significant finds, with scientists predicting even more spectacular results in the near future. “This is very significant research because it will provide a great deal of evidence about the history of the Naval Battle that we did not know about till now. We had just the ancient sources to go on and nothing more. Research should have started many years ago, but this had not been possible because of pollutants on the seabed since it is well known that there are very many shipyards and ship repair units in the area. Nevertheless it happened, thanks also to the help of the Institute of Marine Archaeological Research with whom we are collaborating” said Angeliki Simosi, Head of the Ephorate of Underwater Antiquities to the AMNA, during a guided tour of the area conducted exclusively for the Athens and Macedonian News Agency. “I hope in the years to come to have the same success we had this year, where sections of very solid buildings were revealed, which have yet to be completely identified. Nevertheless, the existence of two towers, one circular and one square, indicate that it is the closed military port of the ancient city” she continued. The research is being carried out within the framework of a three year programme of collaboration (2016-2018) between the Ephorate of Underwater Antiquities of the Ministry of Culture and Sports and the Institute of Marine Archaeological Research, headed by Dr Angeliki Simosi and Yannis G. Lolos, Professor of the University of Ioannina and the Institute’s president. Also participating in the research is the Marine Geology and Physical Oceanography Laboratory of the University of Patras, under Professor George Papatheodorou, with Associate Professor Maria Geraga as its main collaborator. “It is a very big research project that is in its first stages. It will continue however, since the Institute of Marine Archaeological Research and the Ephorate of Underwater Antiquities decided to begin this research in this most significant historical spot in Greece. There are many difficulties of course, but the goals are important. I am certain that in the course of our research we shall have movable finds –we already have some significant ones– which will be associated with momentous events of Athenian history. And of course, the Naval Battle of 480 BC is a major event, the zero hour of Athenian and Greek history” said Mr Lolos to the AMNA. “It is a three-year research programme, that will continue till 2018. It evolves at the head of the Ambelakia Bay, i.e. in the port of the ancient city of Salamis and in parts of the sea area on the north side of Kynosoura, up to the end of the long Peninsular that marks the Bay’s south side. A trophy was placed, in fact, at the end of Kynosoura , or rather one of the trophies we know were erected after the great victory of 480 BC” adds the professor, noting with Ms Simosi, something very significant: Their conviction that in the sea area of Kynosoura, at the end of the peninsular, pieces exist of the ancient trophy erected after the Naval Battle. “There are stone plinths in the sea that must belong to the trophy. We know that the monument was placed at the end of Kynosoura, we will investigate the sea area on both sides of this part of the peninsular, north and south, and we believe we will locate parts of it”, both explain to the AMNA. However, what exactly has been located these last two years during the underwater surveys in the Ambelakia Bay? First of all, there are two towers: a strong, square one on the Bay’s west side, consisting of substantial stones (whose sides measure 7.70m) and a circular defence tower at the end of a long wall (“arm”), 162 metres long, to the north west. The above were obviously connected with the greater fortification system of a Classical-Hellenistic city and its port. A large, solid, 13 metres long construction was also located on the north side of the bay, carefully made of stone plinths. “It is a public building; possibly a temple or portico. We have many movable finds from its final use in the 3rd c. AD. This construction must be one of the ancient city’s last buildings near the port and possibly one of those seen and described by Pausanias, who visited the city of Salamis in the 2nd c. AD”, stressed Mr. Lolos. He himself believes that it is most probably a temple and explains the rationale based on the movable finds. “For a start, we have fragments of statues, one of the four corners of a small marble alter, as well as some other fragments of marble utensils. Moreover, in 1882, an important inscription was found in front of the Kriezis Mansion (a house a few metres away from the find, Ed.) that dates from the advanced 4th c. BC”, says the professor, adding that it is a votive inscription dedicated to the nymph Salamis with the names of the hipparch /general of the cavalry and the cavalrymen. “According to Lolling, the German archaeologist, a sanctuary of the nymph Salamis must have been here. The inscription has probably been lost, its publication can be found however in the journal of the German Archaeological Institute of 1882”, Mr Lolos notes. The building is adjacent to a later, 48 metre long pier, constructed prior to 1900 with ancient material. In fact, its layers of stone that bear a great resemblance to those of the solid construction, has led the researchers to speculate about their originating from the public building being investigated. 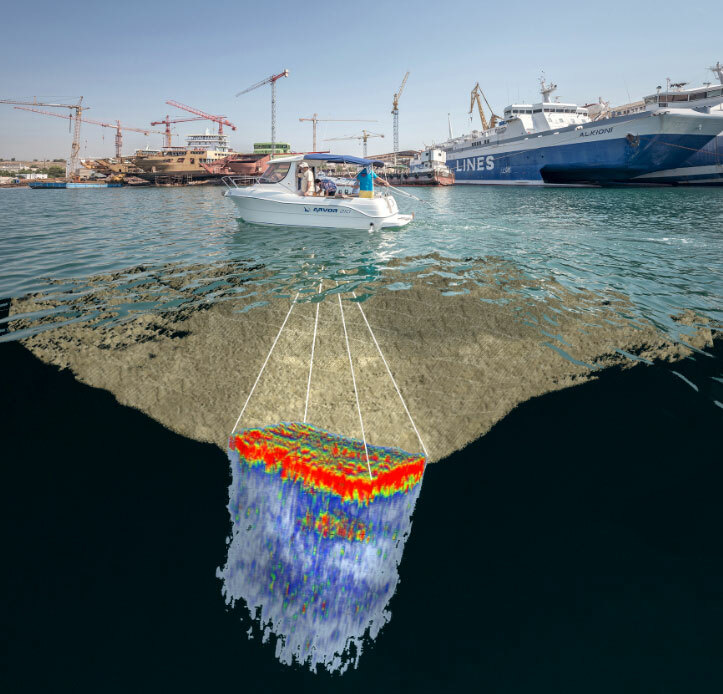 Geophysical along with marine research continues in the innermost part of the Bay, reaching the end of Kynosoura and beyond, with the help of the Marine Geology and Physical Oceanography Laboratory of the University of Patras. The research goals are twofold; locating, on the one hand, the coast line of the Classical period and reconstructing the area’s coastal palaeogeography. On the other hand, locating “targets” of potential archaeological significance (e.g. ships’ battering rams), that are on the seabed or buried under it, as deep as a metre and a half. “An excavation must be conducted to identify these ‘targets’. Are they modern or ancient objects? Most probably some of them are ancient and we also hope there will be important ones, but a systematic investigation at such a depth demands a lot of work. We must also make a choice in collaboration with the geologists; which of these 50 targets should we approach? Which should we start with? How many can we investigate in each research period? This is a very big project”, points out the professor about the research that began as a three year project but will require much more time. Consequently, all help is useful. According also to Ms Simosi, “Chinese marine archaeologists have shown great interest in the region, when visiting Greece for a few days. They wish to collaborate” she said. It would certainly be very interesting to find objects related to the Battle of Salamis before 2020, which will mark 2,500 years from the historical event that changed the course of history. The results of the two research periods will be jointly presented by the two researchers at the International Scientific Conference organized by the Honor Frost Foundation in Nicosia, Cyprus, on October 20-24.